Our leadership team works tirelessly to build relationships and deliver outstanding projects to our customers. Equipment and processes are continuously evaluated to stay in front of the competition. It is our goal and our promise to deliver the highest quality products and services to our customers. Ours is a story of family, hard work and innovation. It begins with two brothers, Tim and Tom Hopping. Born and raised in West Michigan, their father worked for a local steel erection company. He taught the boys by example the value of hard work and dedication. After high school, Tim joined his father in the field. He became passionate about the business. He worked hard to master all aspects of the trade. Tom was interested in the business side of things. He took interest in starting companies from the ground up. Both brothers excelled separately, but the real magic happened when they decided to combine talents. Tim and Tom joined forces together and started a steel erection company, Belmont Construction. After years of specializing in on-site erection, the brothers recognized a need for quality steel fabrication. With Tim’s extensive knowledge in the steel industry and Tom’s business savvy, they invested in a building with basic equipment and a handful of employees. 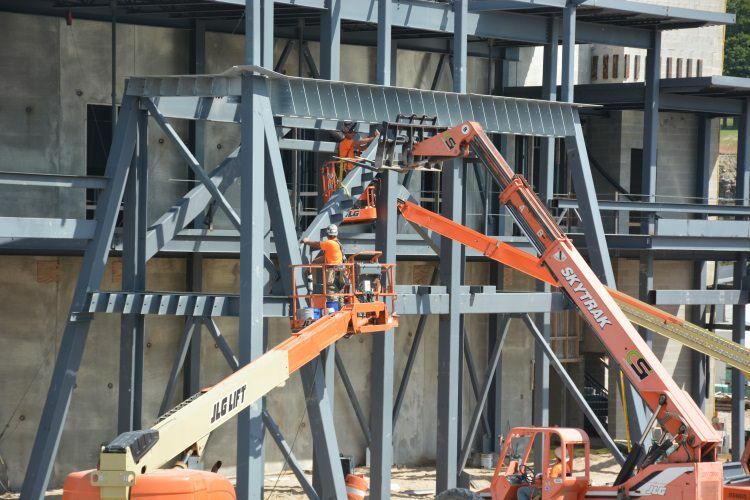 As the company grew, they prioritized technology and automation, making significant upgrades to material handling and beam line equipment. Builder’s Iron was the first in the state to invest in a Controlled Automation Coper, providing state-of-the art CNC steel processing. Along with capital improvements, the brothers recognized the need for highly qualified leadership and began to assemble the team that exists today. Builders Iron Inc. is looking for individuals with passion, talent, and drive. Find a career here.